Here’s a hard question. It has a little setup. I get a lot of spam on CSS-Tricks. I employ various evolving technologies to help fight it. One of them, Akismet, has blocked almost 1.5 million spam comments from the site. Despite doing a pretty good job, a lot of spam slips through. Maybe a few dozen a day. I have to clean up of that by hand, which I’m glad to do, because it’s part of having a community. I’ve cleaned up so many spam comments over the years that I have a brain/eye/muscle memory for it. I feel like I can practically smell a spam comment. I can look at that URL and know it’s spam. But sadly, you know what I notice first? The arabic writing. 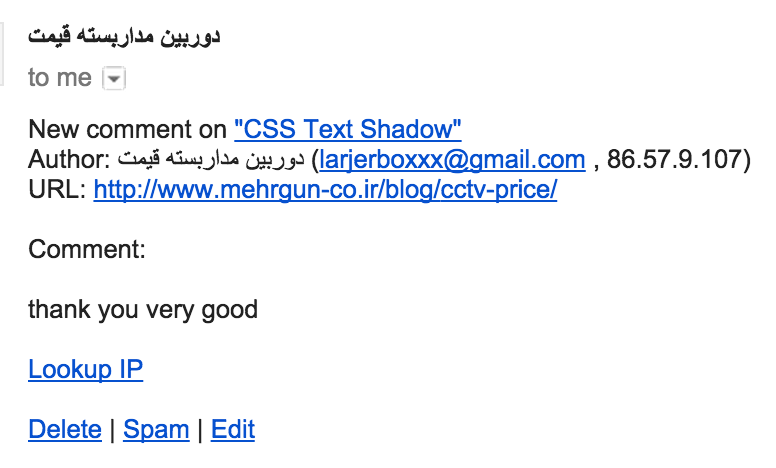 I’d say there is near 100% chance that if a comment has arabic writing, on my site, it’s spam. I hate spam. I get pretty intense feelings about it. And now I’ve started to associate arabic writing with something I hate. I know that’s not fair. I know that arabic writing isn’t to blame for this. I should be such a controlled, evolved, intelligent person that this doesn’t affect me in any way. But I don’t know if any of us are really that strong. If a rabbit comes and shits in your bed every day, you’re gonna start to hate rabbits even if you know that’s not fair. But now that I’ve noticed this, I need to take steps to ensure I don’t build up misplaced associative hate just because of how my brain is wired up. I might buy a painting or a print that I find beautiful that has arabic writing on it and hang it somewhere I see everyday. I might try and remove the author name field from the comment notification fields I get, so I can focus on the more important URL field and comment content. But I’d also love to hear if you’ve faced similar challenges and how you dealt with it.